The sun has been up for several candlemarks, but in the little shack where Ka'Ri lives with her family the light isn't much brighter than it would be in the dead of night. 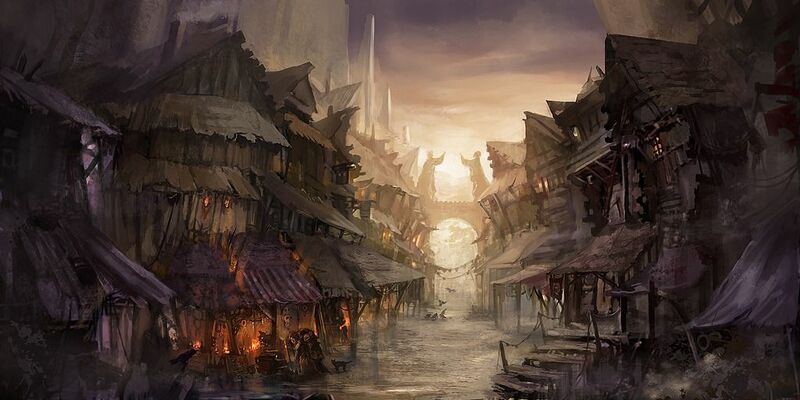 Such is life in the city slums: with the city wall towering above them, and identical shacks pressing in on every side, there's little in the way of natural light to let in until high noon when even the walls can't keep out Pelor's brilliance. Light isn't necessary for her to start her day, of course; the tiny shack is small enough--and she's been land-locked far long enough--to know the layout by heart. She's able to move about, prepare meals for herself and the ill ones, roll up her bedroll and stash it out of the way, and go about the rest of her morning rituals as she plans out her day and tries to worry the exact right amount (not too much, not too little) about where money will come from today. But it's hard to be deprived of the sun. Almost as hard as the loss of the moon and the stars and the sea breezes on the open sea. She's checking on the sleepers again--still ill, but not yet in the final terminal coma stage, thank the gods--when she hears a soft knock at the door. It's the special little triple-knock that Qiao always uses when he comes to visit her. She rushes to the door as quick as possible. Coin has been low these last few weeks and she has been trying her best to supplement it with cutpurse operations but those are less and less profitable these days and more and more dangerous as more of the crew have been falling under. Opening the door wide, seeing the warm face of Qiao, she can't help but feel her eyes tear up. "Thank Osprem you are here, dearest friend. Please tell me you have good news for us." His own gaze softens at the plea. "Hey, kiddo," he says gently. He gestures for her to join him on the street, the magical mount which pulls his chair waiting with the still patience only a constructed animal can display. "Come walk with me? I'll buy you some breakfast." Qiao often discusses jobs with her out in the little city park nearby her home, where they can see if anyone is trying to approach and eavesdrop. At the sound of breakfast, she can't help blushing in embarrassment. It had been at least a day since she last remembered to eat and without his reminder it would have been likely she would have missed this mealtime as well. "Yes, of course," she recovers as quickly as she can, locking up the shack and matching her pace to Qiao's mount as they travel towards the park. After the moment of mortification has passed fully, she bites her lip and can't help asking, "How obvious is it that I haven't been eating regularly?" She darts her eyes from his answer and chides herself internally. "Sorry, you don't have to answer that. And thank you by the way. In case I didn't say it before." He chuckles easily, the sound low and musical against the street sounds of vendors opening their shops and beginning their day. "Ka'Ri, how long have we been friends? Just because something is obvious to me doesn't mean it's obvious to everyone. Ah, smell that. What do you think: steamed buns or the pastries with the meat inside? I'm quite torn, so you'll have to pick." Choices, my old nemesis, we meet again, she thinks waffling back and forth for far too long. She did not know why it was so easy to choose when to move, when to pick, or how to care for another, but so hard to choose between two good options for herself. Finally in a huff, she digs out a lone copper piece from her purse, flipping it, before pointing at the meat pastries. As the food is prepared, she glances around casually around the park, trying to take in an inventory of who is around this morning and potential problems to watch out for. This early in the morning, the crowd is mostly day laborers: men and women who work hard for a meager-but-honest living with their sturdy bodies. The thieves and cutpurses won't be out in full swing until later in the day when the crowds are thicker and offer concealment--and even then, they'll find better hunting on streets richer than these. She sees a few friends coming home after a long night's work--breaking-and-entering specialists, nightdock workers, and a few courtesans--but most are too tired to do more than nod. Qiao buys a dozen meat pastries--more than enough for them both, with 'coincidental' leftovers for the family back home--and arranges the little packages neatly in his lap as they head for the tiny park. There is a nice tree here that Qiao likes to park beside while they eat. Handing her a pastry, he takes a big bite of his own and makes a satisfied sound. "Gods, that's hot. Temperature and spice. Clari makes the best pastries, I swear. So. I have a job for you, yeah. Pays well, too. But it's... Kinda unusual. Not sure how I feel about that." How do I feel about that? If it pays well, then what do I care? The thoughts rush forward and Ka'Ri is almost ready to voice that but stops short. As Qiao said, he knows her well, which means he already knows about her usual boundaries for work, which causes a well of anxiety to form. "Who exactly would this work be for," she asks cautiously. "And for what?" "Client is a big mucky-muck out of Feytower," he says, chewing on his pastry and looking thoughtfully into the distance; Ka'Ri knows he's keeping an eye out for strangers. "Laerdya Siannodel. You know her?" Ka'Ri has heard of the elven wizard rumoured to be the city's best hope of fighting the plague, as has any other desperate soul seeking after a cure. But she's never seen or met the woman, nor been to the tower where the wizards live and work. Ka'Ri lets out a long sigh of relief. "Yeah, I think so. She's the one that's looking into a cure right? Heh, if the work is about that, I'd gladly work for free! Uh... don't actually tell her that." Wizard stuff, she thought idly. She had had some experience with magical traps while doing some light breaking and entering, but had stayed well away from the Feytower for obvious reasons. Sure, it might end up being dangerous, but coin was coin and if there was even the slimmest chance she could help save her crewmates and captain, she'd gladly risk everything. "So what all does the client need?" Qiao chuckles at the 'work for free' crack. "Oh, believe me: I negotiated hard. Got you a good rate, better than most." He shakes his head, turning his attention back to his pastry. "So you know I sometimes find legit work for people. Not so much for you because, well, non-legit tends to pay more. But this one is all above board, apparently. One of my contacts at the tower reached out to me and they liked what I said about you. They want someone with sailing experience who can be discreet and has a knack for some of the... softer skills." This euphemism covers Ka'Ri's abilities which tend to fall on the wrong side of the law. "What I don't like is that the job itself doesn't have a lot of details. 'Secret', they says to me. But they give me an advance to give you just for showing up on the 7th of Eleint to listen to the job offer. If you don't like what you hear, my contact swears you don't have to sign on." Ka'Ri thought hard. She understood his hesitation surrounding "secret". The last client to hold out details had led to her in a bit of tight bind when the "quiet sleepy manor" promised had just happened to hold a gala for the city guard on the night in question. But the benefits were too tantalizing to pass up. An advance could cover a good couple of month's rent and a chance to be back on the open seas and maybe even help support a cure for the plague before any of the sleepers fell completely under. And as much as Ka'Ri liked to believe everything was on her shoulders there were a fair few crewmembers who were still left to care for the sleepers in her absence. Beyond that, it was just on her to survive and adapt, two skills she held some moderate pride in. Ka'Ri looked at her old friend, seeing the concern in his eyes, but knew that both he and she knew what she was going to do. If it meant some extra coin and a chance to help even a little bit to save the sleepers, Ka'Ri would move heaven and earth, a mere secret mission was not enough to dissuade her. "I'll be there," Ka'Ri said confidently. "Can you make sure to check in on the crew every now and then when I end up taking the gig?" "I will," he agrees, his gaze soft. Then he stretches in his chair. "Gods, I swear my eyes are bigger than my stomach. I always buy too much. Do you mind tossing these for me when you head back? Otherwise I have to find a trash heap, and it's always down a tight street and my chair likes to get stuck. Thanks, Ka." Pulling out a coin purse, he hands it over with the pastries. "And the advance, minus my finder's fee. Eighty-five gold in there; enough to kit you out in decent equipment for the job and then some. Hold on to it tight going home." Ka'Ri gathered the leftovers with a smile on her face. "You know, you could just say you bought some extra for the old crew. It's not like anyone worth caring about is going to judge you for doing something nice." She pauses mid-gather, a serious expression falling over her face, "Seriously though, thank you Qiao. For everything. I don't know what I'd- any of us would do without your help." Ka'Ri wiped some tears, finishing gathering the leftovers and using the loose wrappers to bind them together and securing the coin purse securely in the inside of her coat, far away from the decoy purse she wore more loosely in the typical location. "Is this a good day to hug you, dearest friend?" She asked at last, finally looking back up at him. He can't help but grin at this. "Just one, or I'll go soft on you--and what's a soft fence worth to anyone?"